To solve the tasks related to the operational management of the technical condition of self-propelled agricultural equipment the method of momentary observations to quickly assess the level of reliability of self-propelled agricultural equipment was improved. 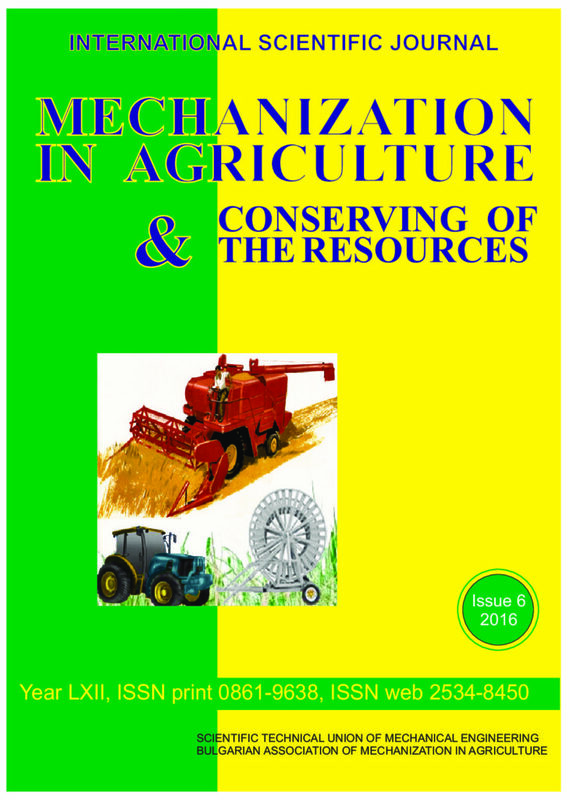 A comparative study of the reliability of the self-propelled agricultural machinery / harvesters / classic method and the method of current observation, and it has been found that the accuracy of the results obtained by the method of current observation satisfy the requirements for practical usage. Irrigated agriculture plays an important role in agricultural production in Kazakhstan. In case of optimal use of land and water resources irrigated agriculture could become a significant driving force of agricultural production. Strategically important crop products such as cotton, rice, sugar beet, tobacco, vines, melons are grown only on irrigated lands of Kazakhstan. A study was conducted to evaluate the acidification of soils and abundance of phosphorus , potassium and magnesium in 50 selected farms located in two different regions in Poland. It has been found that in many cases, soils were characterized by improper – in the aspect of formation of a sustainable crop production- reaction and the content of P, K and Mg. Based on the results, recommendations were formulated to improve the current situation. EFFET OF USING HUMIC, FOLIAR APPLICATION OF COMPOST TEA AND WERMIWASH ON YIELD AND YIELD COMPONENT OF SAFFLOWER CARTHAMUS TINCTORIUS L.
The objective of the present study was to determine of effect of humic acid application and different foliar application of vermicompost extract and vermiwash on yield and yield components of safflower under using different levels of humic acid application in soil. A field experiment was conducted at the Vali-e-Asr University of Rafsanjan, Rafsanjan, Iran. The experiment was conducted as factorial based on randomized complete block design. Treatments were included soil application of humic fertilizer (0, 500, 1000 and 1500 kg.ha-1) and foliar spraying of vermiwash 1:10, vermiwash 1:20, compost tea and distilled a water as control. Seeds were hand-sewn with density of 40 plants m-2 and a depth of 5 cm with row spacing of 50 cm. The plots were irrigated after 70 mm cumulative evaporation from standard evaporation pan class A and irrigation amount was based on soil moisture depletion. Seed yield and number of heads were determined by harvesting 10 plant at random from the four central rows at physiological maturity stage. Seed yield in each plot measured with 14% humidity. Number of seeds per heads was determined by measuring 30 heads at random from 10 randomized harvested plants. Analyses were performed with a personal computer using the MSTATC software. A factorial analysis of variance (ANOVA) was performed for all parameters. Results showed that humic fertilizer significantly affected head number, seed number, 1000 seed weight and seed yield of safflower, however there was no effect on branch number. The highest grain yield (5822.1 kg.ha-1) obtained in 1500 kg humic. Foliar spraying significantly effect on branch number and the highest yield (4858 kg.ha-1) was obtained by spraying of compost tea.